Welcome to the new web site of the Ferintosh Community Council (FCC), Ross-shire, in the Highlands of Scotland. 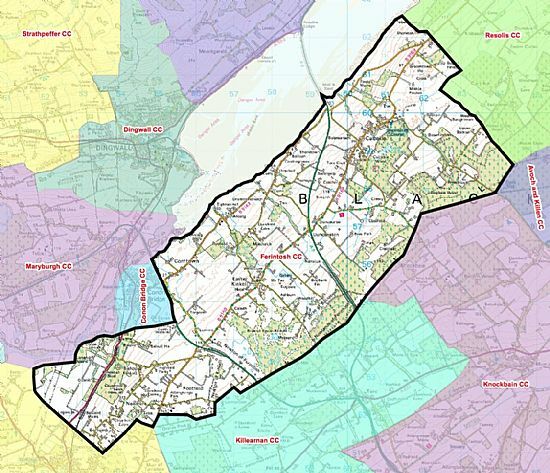 The FCC area lies within the Black Isle Ward of The Highland Council local authority area. This rural area, home to over 2000 residents, provides commanding views of many mountainous areas around the Cromarty Firth with the Ben Wyvis massif dominating. Community Councils are voluntary organisations that act as a voice for their local area. The general purpose of a Community Council is to "ascertain, co-ordinate and express to the local authorities for its area, and to public authorities, the views of the community which it represents". FCC has been particularly focused for some years now on ascertaining the views of residents by developing an email list that currently provides contact with approximately 40% of voters. FCC meets monthly throughout the area to discuss planning applications and the issues of most concern to residents. Currently these issues include the hazards of our roads, poor broadband provision and the state of support for people in their own homes. All meetings are held in public and we welcome all residents to come along to hear about all our ongoing projects and to air your views. Community Councils are governed by the Scheme of Establishment. This sets out how they should operate including elections, membership rules and meeting arrangements.